L. intermedia specimen, Berlin Museum. Physical description: Small, about 10 to 12 mm in length. Light brown in color and very shiny with dark brown membrane. Scutellum is yellowish brown and lighter on the sides. Clavus slightly darker than surrounding area. Pronotum black and dark brown, coarsely dotted. Ventral side is yellowish brown. Appendages are brown. 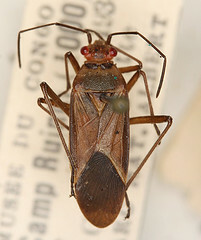 Leptocoris intermedia has been found in Uganda but the exact location of where it was collected is not known. Currently, we cannot infer a range for this species because we do not know what host plant it uses and have no recorded collection points.